Murals give a unique look to (child) rooms or office spaces . Color , size and image are tailored to the needs and interior . Whether or not you have a particular theme or figure in mind, vlekks offers free advice to achieve an appropriate atmosphere or image. The murals are made with high quality acrylic paint. This is odorless, dries quickly and also retains its fresh colour over a long period. The prices of murals are of course dependent on the image size and level of detail . Prices below are indications, including 6% VAT and material. A mural of less than 1 m2 sits on a target price from 150,- euro . 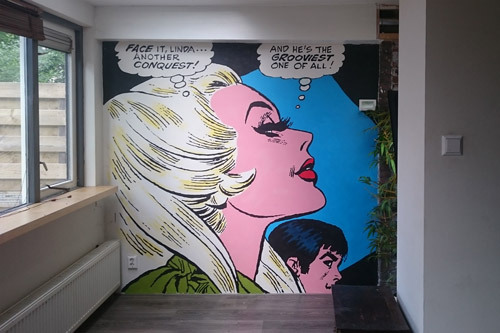 A complete mural by example 2 x 2.5 m , sits on a target price from 425,- . Euro. Larger projects at 75 ,- Euro per m2.